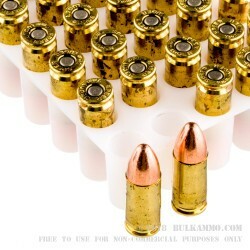 New ammunition for general purpose shooting, this 124 grain TMJ (Total metal jacket) load is a significant value. The per round cost is on par with most range reloads and the new manufacture; along with factory standards and protocols, quality control and the ability to reload makes this purchase a very significant bargain – especially for bulk shooters. 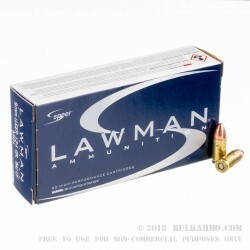 A perfect load for plinking, range work or for general fun with your various 9mm’s, this Speer ammunition is cased in brass, and utilizes a Boxer primer, making it easily reloadable. The conical 9mm projectile feeds extremely well in just about any firearm, and the accuracy is very high. 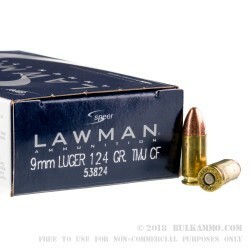 For new manufacture ammunition this is a steal of a deal. The relative reliability and consistency far exceeds remanufactured ammunition and range reloads. Not a particularly hot round, this load still has sufficient power to reliably cycle most firearms, it achieves 1090 fps and 325 ft. lbs. 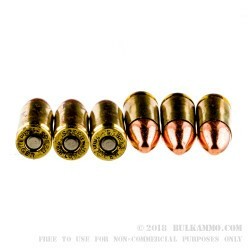 of energy at the muzzle; which has been proven to easily keep most 9mm’s functional while preventing FTF, FTE and other shooting concerns usually caused by inferior ammunition performance.